When we have a very busy weekend coming up where we'll be working on outside or inside projects I like to plan ahead and make meals very easy. I usually start with a rotisserie chicken that I buy on Friday. On Friday night we start with the hot from the store chicken and cut generous slices from the breast and make a nice chicken sandwich or have the chicken with a side salad. After we've had our fist meal I take all the meat off the bones and refrigerate it for the next day. I put all the bones from the roasted chicken and make a nice broth. To the pot of bones covered in water I add a whole onion quartered and seasonings like salt, pepper, poultry seasoning, garlic, and a bay leaf. Bring it to a boil and then simmer it for an hour or two. Then I strain the stock and refrigerate the stock. The next day with all the ingredients handy I assemble a dish I'll call Enchilada Pie. Gather the following ingredients and start the layering. I used a smaller casserole dish since I was cooking for two. You can use a 9x13 pan if you are feeding more. Las Palmas Green Enchilada Sauce (28oz.) or similar canned enchilada sauce. I used Medium sauce. You can choose medium or mild sauce based on your preference. Heat the broth in a small saucepan. Add a little Enchilada sauce to the bottom of the casserole to coat the bottom. 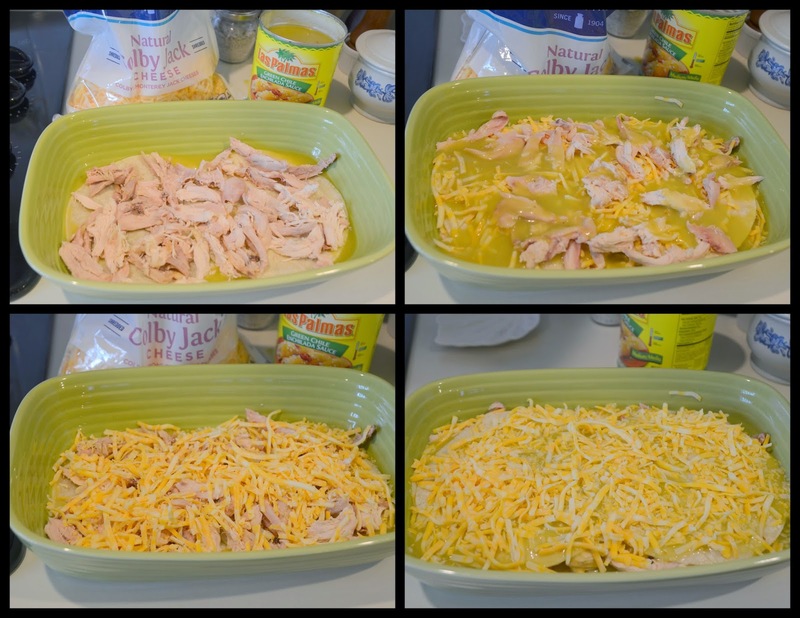 Dip one corn tortilla at a time in the broth and transfer immediately to prepared casserole dish. In my dish two tortillas were used for each layer. 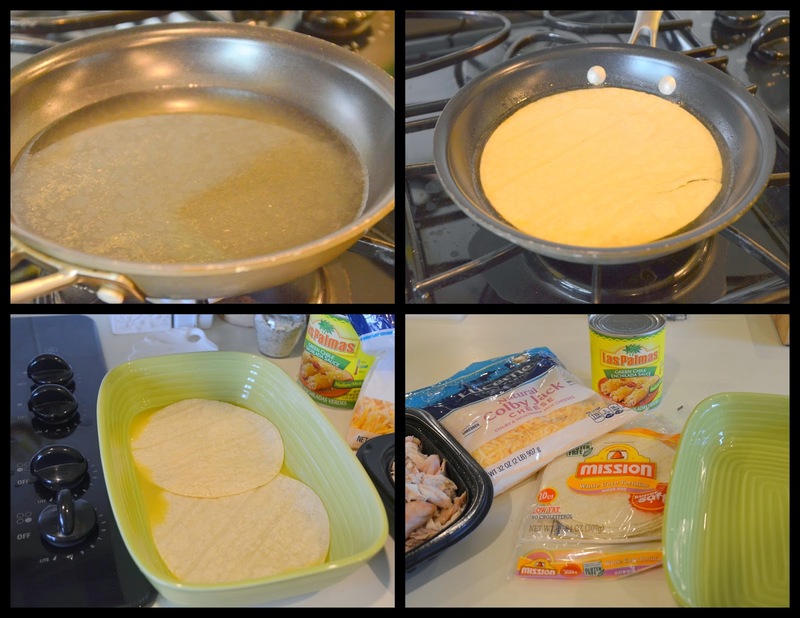 Layer some chicken on top of the tortillas. Pour some Enchilada sauce on top of the chicken. Layer some cheese on top of the sauce. Layer two more tortillas dipped in broth on top of the cheese. Continue the layering finishing with cheese on top. Heat in 350 degree oven until the cheese melts and the sauce bubbles. After I put the Enchilada Pie in the oven I heated the broth from the night before and brought it to a boil. I had 1/3 of the can of Enchilada sauce left and I added that to the broth along with the remaining chicken pieces and some noodles for a Chicken noodle soup with added flavor from the enchilada sauce. If you have any leftover rice you could use that in the soup instead of noodles. One Rotisserie chicken provided 3 full meals for my husband and me with leftover soup and leftover enchilada pie. Quite a good yield from my $4.99 chicken. Hope you can use these tips and meal ideas from my Saturday Kitchen. $4.99? Good deal! (Our rotisserie chicken is $6.99.) The enchilada casserole sounds so good! Same here. Our store-bought chicken is $6.99 if you're lucky. I've also seen it for $8.99. So $4.99 is a great deal. Stretched over 3 meals is even better. This was a Costco Rotisserie Chicken...so far always $4.99 here. Our grocery store rotisserie chickens and $6.99 or more! A rotisserie chicken is about $8-9 in Alberta, depending on which grocery store you purchase it in. Regardless 3 delicious meals for under $10, Amazing! Thank you Ellen! 9.99 in Winnipeg. Still, a good deal with this many meals from it. Thanks! Your casserole looks so good. What a great way to use up chicken leftovers. 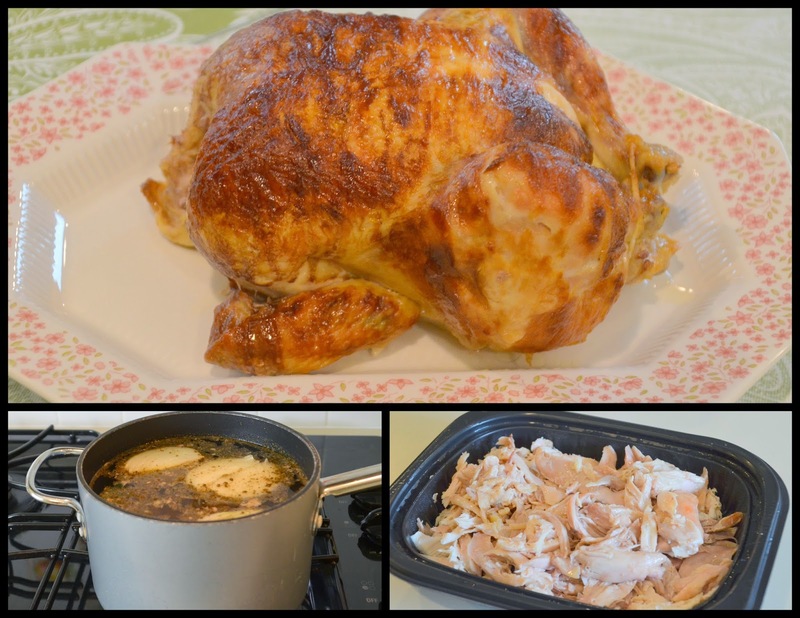 I am always so thankful for those rotisserie chickens - they usually "save the day" for me! Just like you, I use the bones to make the stock for my chicken noodle soup...it's something that was handed down from my grandmother and my mother. We put everything to good use. The only difference in our chicken soup is the spice. My mother's family was from Germany. We use whole allspice with onion, celery, parsley and tiny bits of tomato to flavor our broth. If we are making chicken rice soup, we substitute the tomato with carrots. Yummy sounding meals. I'm going to try that Enchilada casserole, something I've been afraid of but you made it sound very familiar. You paid $4.99 for the chicken? I have never seen them here less than $8.99, on special, and they are small. Sharon, The Costco's in our area sell their rotisserie chickens for $4.99, everyday. Ahh I see. Am not a member. Right after I read this I went out and found Sobey's chickens at $9.99 regular, on sale at $8.99 after four o'clock. So I went back at 4 p.m. and then forgot the enchilada sauce. I'll do that tomorrow. I do always make broth as you say. It's indispensable. I like to have mine just as a cup of broth, when I'm hurting too much to cook, or as the first course to a meal, the broth with frozen chopped Kale and lemon juice. It's very Portuguese green soup tasting. By then, I usually feel competent enough to actually cook something. I like these little meals that are just plain satisfying and quick. I am wondering if I could use green salsa instead of green enchilada sauce. What do you think?